I often fantasize about if I had the space I would love to have a dedicated reading room and how it would look. At the moment I only have a very small bookshelf that doesn't hold many books at all in my bedroom. I would decorate it in neutral warm tones with a hint of metallics and a light wooden floor to ensure the room is always bright and welcoming. The Billy bookcase from Ikea is cheap and cheerful and gives the feel of being in a library because they are so tall. I would love one or two of these filled with books organised by colour, it's not always the most practical way to organise books but looking at my rainbow arranged shelves at the moment really makes me happy. Of course I would have some Funko Pop figures dotted around the bookshelf too from my favourite series, like the super cute Harry Potter ones. Of course an armchair is needed to relax and read books in and I love the look of the Kolton armchair from Made. 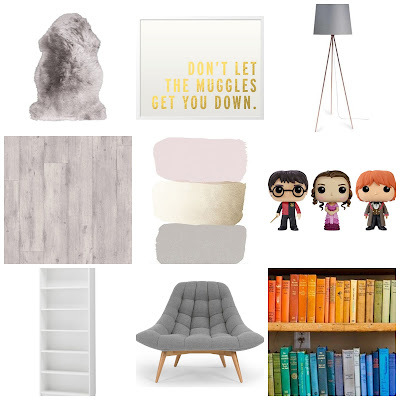 The colour fits into the neutral tones of the room and it looks like it would be big and cosy to curl up and read in. Good light is needed for those dark winter nights and this Whity copper floor lamp from Maisons Du Monde looks like it will provide plenty of light and looks stylish too. A faux fur rug is also essential for those cold winters too to make sure the room feels nice and snug, the one pictured is from Dunelm. Lastly, I would decorate the room with a few framed quotes/literary themed prints. Etsy is full of incredible designs like the Don't Let the Muggles Get You Down one pictured. A mix of black, white, and metallic frames/prints to tie the whole theme together. Looking at this collage makes me so happy, but also sad that I don't actually have any room to do any of this! 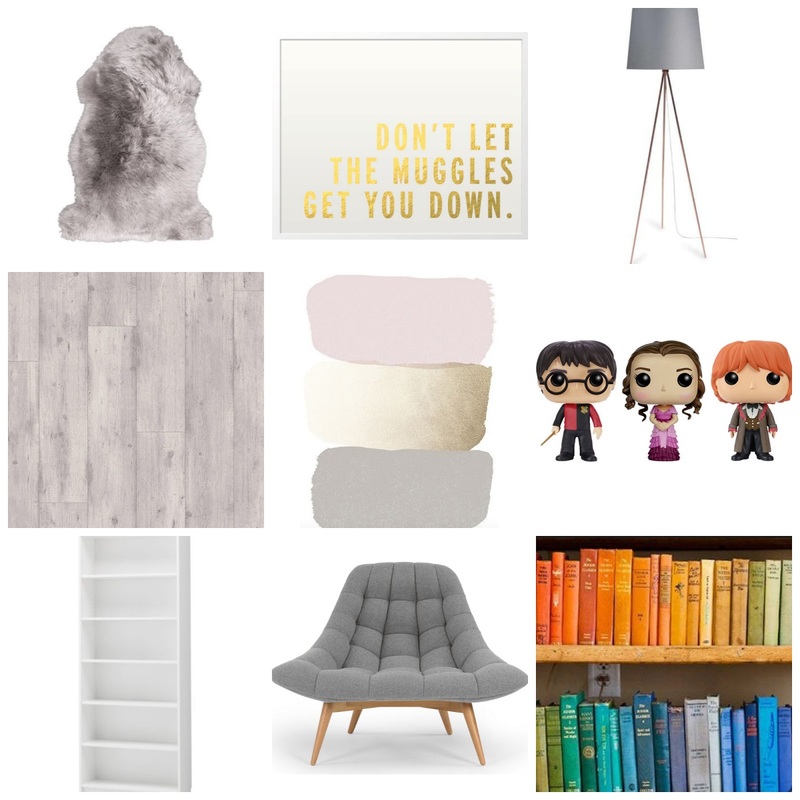 What is your ideal reading space? The armchair looks so cosy! I'd love a designated reading chair one day. This sounds like a lovely reading spot! !